Last week’s bombings at the Boston Marathon attracted broad public interest: 63% of Americans say they followed the story very closely, among the highest interest in any news story in the past decade. And the bombings drew far more public attention than any terrorist event since Sept. 11, 2001, which 78% reported following very closely in mid-October of that year. While the Boston bombings riveted most Americans, the incident appeared to confirm the public’s long-held belief that occasional terrorist acts are to be expected. Over the past decade, majorities have consistently said that “occasional acts of terrorism in the U.S. will be part of life in the future.” This sentiment has spiked to 75% in the wake of the Boston bombings from 64% a year ago and now matches the previous high of 74% in 2003. 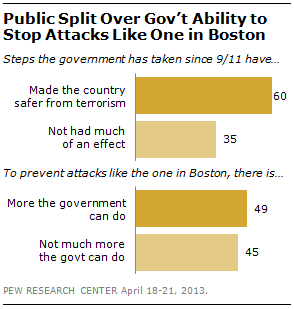 The national survey by the Pew Research Center, conducted April 18-21 among 1,002 adults, finds that the public is evenly divided over whether there is more the government can do to prevent attacks like the one in Boston: 49% say there is more the government can do to prevent such attacks, but nearly as many (45%) say there is not much more that can be done. The steps the government has taken since 9/11 are generally seen as having made the country safer. Six-in-ten (60%) say steps taken by the government since Sept. 11, 2001 have made the country safer, while 35% say these actions have not had much of an effect. The survey finds only modest partisan differences in these opinions. Republicans and Democrats are about equally likely to say terrorism will be part of life in the future (78% of Republicans, 73% of Democrats). Members of both parties are divided over whether or not there is more the government can do to prevent this type of attack. However, Republicans (69%) are more likely to credit the government’s post-Sept. 11 actions for making the country safer than are independents (59%) or Democrats (58%). Television was far-and-away the most widely-used source of information about the bombing and its aftermath; 80% of Americans followed the story on TV. About half (49%) say they kept up with news and information online or on a mobile device, and 38% followed the story on the radio. Only 29% say they kept up with the story in newspapers, about the same number (26%) tracked the story on social networking sites like Facebook or Twitter. Despite some factual errors over the course of the week, the press receives generally favorable marks for its coverage of the news from Boston. About seven-in-ten say the press has done either an excellent (32%) or good (40%) job; only about a quarter rate the press coverage as only fair (14%) or poor (8%). About as many Republicans (75%) as Democrats (79%) rate news coverage of the attacks positively. In April 2012, more than a decade removed from the 9/11 attacks, 64% agreed that occasional acts of terrorism in the U.S. will be part of life in the future. Today, 75% express this view, with much of the increase over the past year coming among young people. A year ago, 18-29 year-olds were far less likely than older Americans to see terrorism as part of life in the future: just 54% agreed with this statement, compared with 74% of those age 65 and older. But the share of young people who say this has increased 20 points in the wake of the Boston bombings, and is now roughly on par with older age groups. There has also been a closing of the partisan gap on this question. 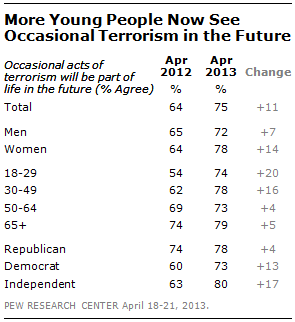 A year ago, 74% of Republicans saw terrorism as part of life in the future, compared with 60% of Democrats and 63% of independents. Today, there is no significant difference across party lines, as the number of Democrats and independents who hold this view has increased. Despite these changing expectations, there is little evidence that the public’s overall worries about terrorism have spiked. Currently, 23% say they are very worried that there will soon be another terrorist attack in the U.S. This is comparable to public views in previous years. 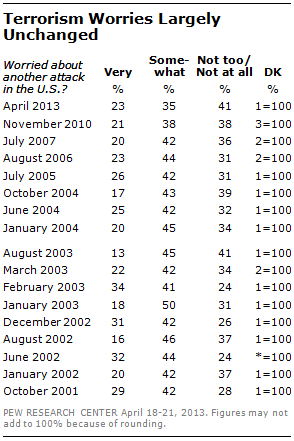 Even in October 2001 – roughly a month after the 9/11 attacks – 29% said they were very worried about this. Comparable percentages of Democrats (27%), Republicans (24%) and independents (20%) express a great deal of concern that another attack will occur soon. There also are only small partisan differences in some other reactions to the attack. About half of independents (52%), Democrats (49%) and Republicans (48%) say there is more that the government can do to prevent attacks like the one in Boston. However, Republicans (69%) are more likely than Democrats (58%) and independents (59%) to say that the steps the government has taken since the Sept. 11 attacks have made the country safer. 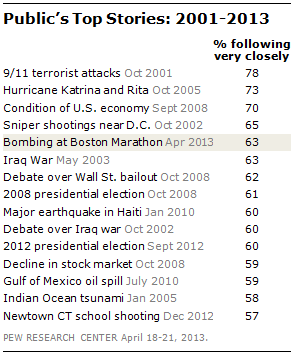 Overall, 63% say they followed news about the Boston attack very closely, the highest level of interest for any story since the 2008 financial crisis; in September of that year, 70% tracked news about the economy very closely. Interest in the Boston bombings is on par with such recent events as the Iraq war (63% very closely), the debate over the Wall Street bailout (62%), the Haiti earthquake (60%) and the 2008 (61%) and 2012 (60%) presidential elections. 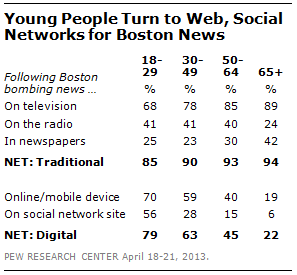 While television was the public’s top source for news on the bombing overall, people younger than 30 were as likely to follow this news online as on television; 70% say they kept up with news about the bombings online while 68% tracked the news on television. 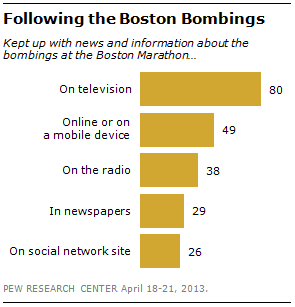 Among older age groups, far more kept up with information about the bombings on television than followed it online. And a majority of young people (56%) say they kept up with news and information about the bombings on social networks like Facebook and Twitter. Among older age groups no more than about a quarter followed news about the attack on social networks. Overall, 26% say they have been keeping up with news and information about the bombing at the Boston Marathon through social networking sites like Facebook or Twitter. When asked an open-ended question about why they are following news on social networks, the two most common responses are that the news “is just there” on social networking sites, or that they are already on their computer and can’t avoid it (18%), and that it is another way to keep up with the news and get more information (13%). About one-in-ten cite the ease and convenience of following news on social networking sites (12%) and the fact that it is fast to use and up-to-date (11%). 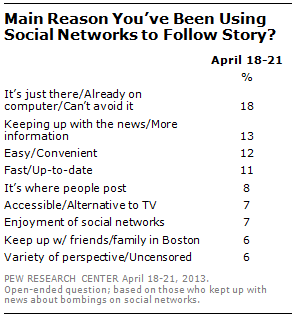 Another 6% say they used social networks to keep up with friends and family in Boston. Relatively few people who followed news about the Boston attack on social networks specifically mention the quality of the information. However, 7% say the main reason they went to social networks to follow news about the attacks is that is an alternative to television and 6% cite the variety of different perspectives on social networks or note that the information is uncensored. About seven-in-ten (72%) say the press has done either an excellent (32%) or good (40%) job covering the Boston marathon bombing; relatively few say they have done an only fair (14%) or poor (8%) job in their reporting. Press ratings are similar to those given in March 2011 in response to coverage of the shooting of Congresswoman Gabrielle Giffords in Tucson, Arizona. The press has generally received more positive than negative ratings for its coverage of other major news events, including the shootings at Virginia Tech and Hurricane Katrina. Ratings were particularly high for the job the press did covering the September 11th terrorist attacks: in September, 2001, nearly nine-in-ten (89%) said the press had done an excellent (56%) or good (33%) job covering the story.